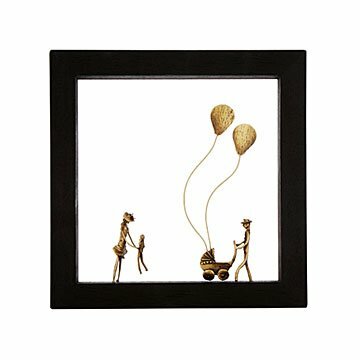 This uplifting bronze vignette captures your family ties. Celebrate your family ties with George Roumanas's Ayous wood shadowbox display that captures the joys of parenthood. The artist breathes life into molten bronze by sculpting the warm-hued metal into a happy couple and their children enjoying a carefree outing together. Handmade in Greece. This is a nice piece, looks exactly as pictured. Important to take note of the dimensions- 8x8 might be a little smaller than you imagine it to be. One note - the older child is a girl (she has long braids). I couldn't discern a gender from the online image and thus assumed it wasn't obvious. We have two boys. I still like it, as did my husband, and we're keeping it but had I known in advance that it was a girl I probably would have looked for something else.